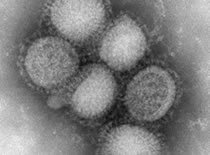 Novel H1N1 (referred to as “swine flu” early on) is a new influenza virus causing illness in people — and it seems to be spreading worldwide now. This new H1N1 virus was first detected in people in the United States in April 2009. Other countries, including Mexico and Canada, have reported people sick with this new virus. This virus is spreading from person-to-person, probably in much the same way that regular seasonal influenza viruses spread. Why is novel H1N1 virus called “swine flu”? This virus was originally called “swine flu” because laboratory testing showed that many of the genes in this new virus were very similar to influenza viruses that normally occur in pigs in North America. But further study has shown that this new virus is very different from what normally circulates in North American pigs. It has two genes from flu viruses that normally circulate in pigs in Europe and Asia and avian genes and human genes. Scientists call this a “quadruple reassortant” virus. Though the initial media spotlight has gone from Swine Flu, what we can see is that the virus is now spreading at a brisk speed. A critical threshold will be reached when we have a million cases of this flu, and it can spread very rapidly from there on. Its a dangerous partner coming along with the current economic recession. US CDC Update 7/24/09: 43,771 cases of novel H1N1 flu, 302 deaths, 55 states/territories affected in USA alone. There are over 300,000 cases worldwide, and we are getting about 5000 new cases every week! When a cold leads to the addition of a cough, child could be developing bronchitis, a respiratory condition where the lining the trachea and the bronchial tubes leading to the lungs and become inflamed, producing an abnormal amount of mucus. The development of a cough is the first in a line of symptoms of bronchitis in children. As mentioned above, bronchitis often manifests itself on the tail end of a cold and therefore is most likely caused by a virus rather than bacteria. When a viral infection is the cause of bronchitis, antibiotics do not help this condition. In children, symptoms of bronchitis present themselves after a cold or even the flu and can even be the result of the measles or whooping cough. Prolonged exposure to secondhand smoke from cigarettes and other tobacco products can lower the immune system of children, inviting more colds, thus inviting bronchitis as well. Heavy allergens in the air and even air pollution can be contributing factors of this respiratory illness. Symptoms of bronchitis in children typically start with the common cold, so sore throat, coughing, mild fever and runny nose are all signs. You will also notice that with the cough that accompanies a cold, it may start off dry but as it turns moist, it could be a sure sign of bronchitis developing. Other symptoms of bronchitis in children include shortness of breath and even some wheezing. Keep in mind however that asthma also shares these symptoms so only a doctor using a stethoscope to listen to the child’s lungs can make an accurate diagnosis. With the onset of symptoms of bronchitis in children, you should immediately make an appointment with the doctor to determine that bronchitis is indeed the culprit. In many cases, a virus is the cause so you should do what you can to ease the symptoms of bronchitis in children to make them more comfortable, which in turn speeds up the recovery process. Fluids such as water, juice and warm soup are all great at soothing the cough as well as thinning the mucus secretions so that they are easier to expel. Occasionally, body aches and mild fever could occur so a children’s pain reliever could be administered. Steam from a shower or vaporizer also eases the symptoms of bronchitis in children and can be administered several times a day as needed. For the most part, bronchitis clears up within five days to a week. However, if the symptoms of bronchitis in children last longer or recur frequently, a doctor can determine if there is an underlying condition which could be contributing to the problem. Acute bronchitis is the inflammation of the bronchial tubes that lead from the trachea to the lungs. Infection is the typical reason that acute bronchitis occurs and the illness often follows a cold or even the flu. A drug treatment of acute bronchitis may not work if the infection was caused by something viral. In this instance, the only thing you can do is alleviate the symptoms and make yourself comfortable while the virus-caused acute bronchitis runs its course. The only way to determine whether this respiratory illness was caused by bacteria is for the doctor to run a blood test or even test some of the phlegm that was coughed up. If indeed your bronchitis was caused by bacteria, there are a few options in regards to your drug treatment of acute bronchitis. For children, milder antibiotics such as amoxicillin and zithromax are prescribed by the doctor. This drug treatment of acute bronchitis in kids is gentler to the stomach than heartier antibiotics that are prescribed to adults. For the adults, tetracycline, biaxin, augmentin and erythromycin are among the antibiotic types that are typical in drug treatment of acute bronchitis. It all depends on the causative bacteria as to which antibiotic in particular is prescribed by the doctor. In some instances, a hearty strain of bacteria may be taking up residence in your bronchial tubes and therefore requires a stronger antibiotic. When this situation occurs, the drug treatment of acute bronchitis is gemiflaoxacin, a drug that targets antibiotic-resistant bacteria. For both children and adults, decongestants may be prescribed to speed up the process of loosening up mucus for expulsion. Another drug treatment of acute bronchitis is the prescription of bronchodilators. This family of drugs is often in the form of an inhaler and works much like medications for asthma – they help open the constricted, swollen airways going to the lungs. Of course, non-drug treatments exist for acute bronchitis as well. These treatments include the use of a vaporizer to breath in steam which helps loosen swollen bronchial tubes. You might try adding eucalyptus, lavender or orange essential oil to the vaporizer as these do help in promoting easier breathing. Many non-alcoholic and decaffeinated drinks and soups are also on the non-drug treatment of acute bronchitis. The fluids help loosen the mucus so that you can expel it from your body. In all, there are a variety of treatment options to try and only your doctor can help you with a drug treatment for acute bronchitis caused by bacteria.